Happy Monday, friends! Hope you had a great weekend and are ready for the week ahead! I’m not sure I’m quite ready (pretty much am never ready for Monday), but at least I know what we’re having for dinner each night! We haven’t had pasta since before Christmas, and since spaghetti is Brantley’s favorite meal, she has been lobbying hard lately to have it for dinner! I decided to give in and we ate it last night. I tweaked it a bit to try to make it a little better for us. I used a sugar-free pasta sauce (do you know how hard it is to find pasta sauce that does not have sugar added?? Harder than you would think! ), used lean ground beef (Scott doesn’t like ground turkey in spaghetti, and yes, I have tried subbing it and not telling him, and he can tell the difference! ), and added mushrooms, onion, fresh tomatoes, green peppers, and spinach. And it was delicious! 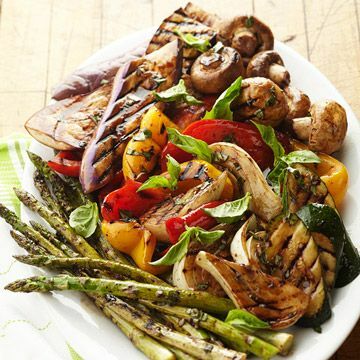 I like using a bottled sauce and just sprucing it up with fresh vegetables. I love stuffed peppers and soup, and this recipe is truly the perfect combination! I have made it a few times before, and it never disappoints. I’m making it tonight and hope we have some leftovers so I can eat it for lunch throughout the week! 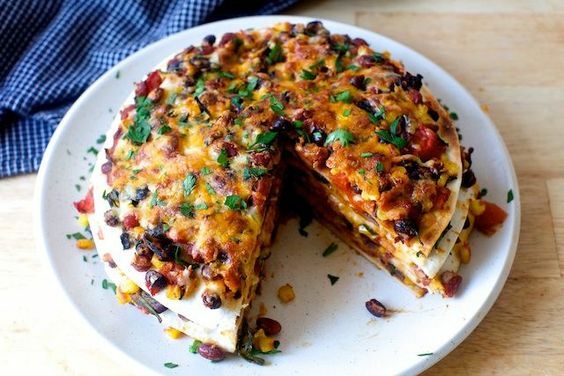 I love a good Mexican casserole, and I am anxious to try this one! I also love that the recipe doesn’t call for meat (though ground beef or even shredded pork or chicken could be easily added), so it will be perfect for an inexpensive and healthy meat-free dinner! Wednesday nights are now busy with our new church small group and kids church. We have to leave around 5:45 to get there in time, so dinner has to be quick and easy (we typically eat around 5:00 or 5:30 anyway) with minimal cleanup. So this week, instead of planning a meal for Wednesday night before I went to the grocery store, I just peeked through the frozen premade dinners and “special value” options that my Aldi had to offer! Their fresh take and bake pizzas looked good (and ARE good! ), and they have huge frozen lasagnas, but I thought what sounded most interesting and what I decided to get was a Gyro Meal Box! It includes everything you need to “make five HUGE gyro sandwiches,” so I thought that would for sure feed us! It includes the pita/flatbread, gyro meat, and even tzaziki for the gyro wraps! I am going to add some chopped tomatoes and onions to them, and serve them with some seasoned french fries. Ta-Da! Dinner complete. I am so anxious to see if they end up being good since I LOVE gyros, and hope I can continue with trying out one convenience meal a week! I am all about one pot or one pan meals (less dishes! ), and I thought this sounded really good. In the recipe, you bread your own chicken, but by Thursdays, late in the week, the easier the dinner prep, the better for me. So I bought frozen breaded chicken breasts, so I am cutting out half the work! I will just slap those suckers onto the sheet pan from the freezer and cook them according the the package directions with the zucchini on the pan too, and then add the marinara and cheese last minute to heat up and get all melty and cheesy on top. I think the kids will really like this one. For the end of the week, I wanted one more meat-free dinner, and since we are obsessed with roasted veggies lately, I am going to pick a bunch of our favorites, and roast them all up together! Asparagus, zucchini, tomatoes, onions, peppers, carrots, mushrooms, and squash (and pretty much anything else left in our fridge) will be diced up, oiled up, and salted up, and roasted for a super easy dinner with my favorite ciabatta. And since last week’s corn casserole was probably the best corn I have ever had, I am going to make it again. Seriously, it is so simple, but it just makes the delicious, sweet flavor or corn SO MUCH BETTER (even winter corn! I can’t imagine how good it will be with fresh, in-season summer corn!). And any and all veggie leftovers will get tossed in a big pot with some chicken broth and pureed into a roasted vegetable soup to eat over the weekend. If there ends up being any leftover! So that’s it for us for this week. What are you eating for dinner? ?